Quang Ninh is not only famous for Halong bay (halong bay cruise), it is also a destination of pilgrimage tourism with many ancient pagodas, temples and traditional festivals. 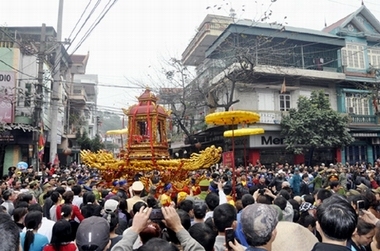 One of the most well known festivals is Cua Ong temple festival, held from January to March on lunar calendar in Cua Ong district, Cam Pha town. of his glorious deed of arms. When Tran Quoc Tang died in 1313, he was said to appear at the longan garden and was reported to King Tran Anh Tong, the King ordered to build the temple to memorize his contribution to the country. Cua Ong area was where Tang deployed his troops in protection of the sea border in north Vietnam, this place was also the site of Bach Dang battle between Vietnamese and Mongolians. Cua Ong temple is one of the relics under Tran dynasty in north east Vietnam, the temple was built on a hill about 100m looking down the sea on the south, two sides of the temple are protected by Green Dragon on the left and White Tiger on the right, behind is mountain range stretching all the way to Cam Pha, Mong Duong areas. There are 3 parts in the temple: Lower, Middle and Upper all combine to make up a tripodal position facing the magnificent Bai Tu Long bay, Lower and Middle temple were destroyed in the French war and have now been restored. In festival season, Cua Ong is busy with travellers abroad and Vietnam, visitors can travel from Halong city via Hon Gai district, or can take a boat cruise from halong bay, cross over Bai Tu Long bay and arrive at the door to Lower temple. Previously local people organized the festival on 2nd Lunar March. The festivity was held with solemnity and rituals including palanquin processions of ancestoral tablets of Tran Quoc Tang. Palanquin is carried from temple to the shrire in Trac Chan commune, also called Longan Garden and return to the temple symbolizing inspect progress of Tran Quoc Tang. Cua Ong temple is known for it's sacredness since it was just a thatched shrine under an ancient tree on the bank of the bay and during the festival tens of thousands of pilgrims and visitors flock to Cua Ong, here you will have a chance to see 34 statues who were generals under Tran Hung Dao and visit historical sites and natural beauty of the north eastern sea.